eLYQD is a platform created for buyers and sellers from all over the world. With an easy to-use online platform, any manufacturer is able to create their own storefront to sell their products, while making use of the platform’s wide range of features for a minimal fee. The eLYQD’s revenue model differs fundamentally from those of traditional e-commerce platforms. Traditional e-commerce platforms typically charge a flat fee on the sale price, sometimes in combination with a commission fee. Buyers may also have to pay fees to PayPal or other payment processing solutions. The eLYQD marketplace will increase the efficacy of all business interactions by freeing them from all kinds of middlemen and making those interactions immediate, transparent, secure and mutually beneficial. This vision will be achieved by creating a fast blockchain-based decentralized ecosystem and organizing user interactions on the peer-to-peer basis. The eLYQD ecosystem will be used by mass consumers and product manufacturers, from all around the world. Distributed blockchain ensures total transparency and verification of each transaction, including detailed product characteristics, its price structure, relevant circumstances of the sale, as well as reputed profiles of the sale parties. The eLYQD ecosystem will be deployed on the Ethereum platform. The peer-to-peer principle of interaction within eLYQD will allow all participants to interact directly. This removes middleman-related costs. The price of a product or a service will be passed over to the manufacturer in its entirety. The end-price of a product will only contain real production costs and a fair margin. 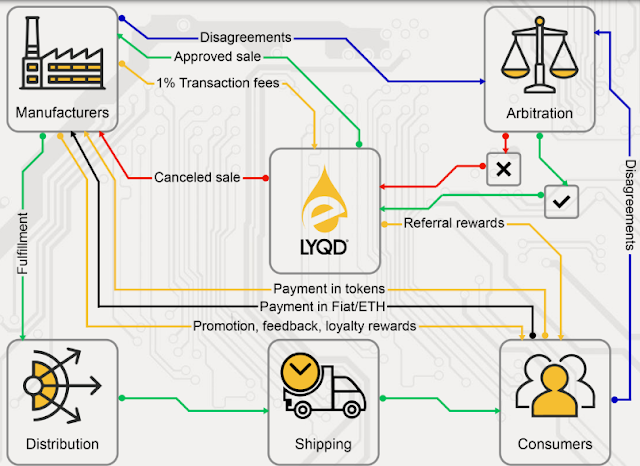 Payments within the eLYQD ecosystem will be effected in the system's own crypto-tokens—LYQD, ERC20-compliant. The function of the token will be to reward users for active use of the ecosystem and contributions to its development (rewards include several types of crypto-paybacks, loyalty, promotions). In the case of a dispute between buyer and seller, an arbitration service is available. We encourage sellers to choose an arbitrator, as it increases the trust level for buyers and also the probability that purchases will be made. If both parties dispute a transaction, the seller will pay the arbitrator out of the escrowed funds. For buyers, arbitration is always free of charge. Every seller and buyer will have a reputation rating derived from their conduct during every transaction. Users with a low or negative reputation score may be filtered out, in order to protect other users from fraud and wasted time. This reputation system will encourage legitimate merchants and customers to act honestly and to build up a solid reputation. Ether, like all cryptocurrencies, is volatile, changing in value on a daily basis, relative to national currencies like the dollar and the euro. eLYQD will develop an integrated payment system that works like ether, but converts to currencies at a ratio of 1:1. Finally, items can be priced in a national currency, and you will know exactly how much you're spending or being paid. Such a direct to consumer (D2C) marketplace has significant advantages over centralized platforms in terms of freedom, privacy, and cost. It can never be shut down, can never go offline, and listing information cannot be lost.Users remain private, if they wish to do so. eLYQD can never be censored, and users cannot be prevented from buying or selling. Payments are processed without the interaction of centralized payment platforms and therefore, making the entire experience easy, cost effective and seamless. Within the eLYQD ecosystem, brands, consumers, arbiters, distribution and shippers interact directly with one another. Transactions are powered by LYQD and therefore they are fast, secure and transparent. There is no need for intermediaries that exist in traditional vaping ecosystems. 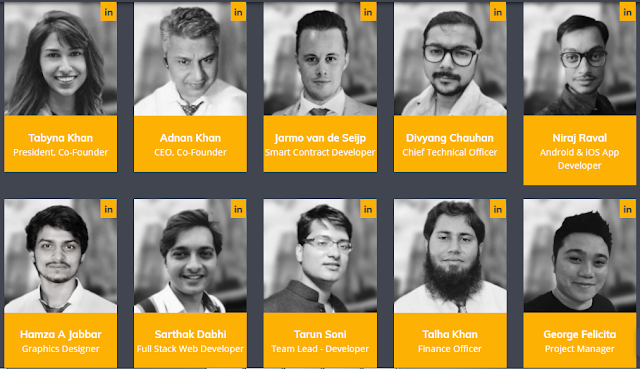 eLYQD will retain all the value generated by the community within the ecosystem. After the ICO period, all contributors will receive an ERC20 exchangeable ELYQD tokens on the Ethereum network. Whenever the ELYQD blockchain is launched with its own token mechanism, the ERC20 token will be always accepted for exchange to a new token 1-to-1. Listed below are a few of the upcoming milestones of the eLYQD project.